The St. Francis Xavier's Cathedral also St. Xavier Church is a Roman Catholic Latin Rite shrine located at Kottar, Nagercoil in Kanyakumari district of Tamil Nadu state, India. While Saint Xavier was doing missionary work at Kottar and its neighbourhood, he averted an invasion of Padagas with the help of his cross alone and thus protected the people of Venad kingdom from that attack which was appreciated by the king, Unni Kerala Varma, who became closer to the priest and befriended him from then on. In recognition of Xavier’s services, the king allotted him a piece of land to construct a Catholic church, as a gesture of goodwill, as per the church records. There was already a small church, in the same place where St. Xavier’s church stands at present, dedicated to Mary the Mother of God, since AD 1544 . 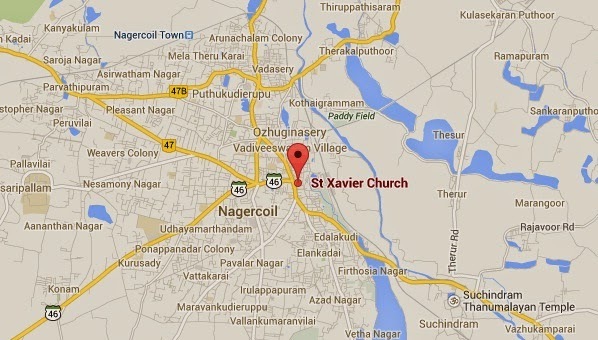 Church records indicate that St. Xavier Church was built in 1600. In 1865, the Shrine of Mary was renovated and enlarged. In 1930, the church was raised to the status of a cathedral. The annual festival is celebrated from 24th November – 3rd December, lasting for 10 days. Pilgrims from all walks of life and creed visit the Cathedral of St. Francis Xavier, Kottar, either to offer their petitions or to thank for the favours received through his intercession. His miraculous intervention in favour of his devotees has been so powerful at this Shrine that it has become almost proverbial to address him endearingly in Tamil " Kettavaram tharum Kottattu Saveriar, meaning, Xavier of Kottar, is the grantor of all favours". The Shrine of St. Francis Xavier as well as the ancient town of Kottar now in the municipal town of Nagercoil, the administrative Capital of the District of Kanyakumari, have checkered histories. Kottar, the commercial and business centre of Nagercoil, is on the bank of the river " Pazhayaru", where the river makes a bend, turning towards the south to the sea. Hence the name "Kottaru" in Tamil meaning is the bend of the river"-. It was a town of importance in the first century of the Christian era when Ptolemy visited and gave it the appellation" Metropolis". It is also honourably mentioned in periplus of the second century. Kottar, the southern capital of the Venad Kingdom, was also a cosmopolitan town embracing within its orbit people of many castes and creeds. Among the many people in Kottar there was also a colony of Chavalakars, a kin to the Paravars of Cape Comorin region. It was to teach them and their counterparts in Manappadu area, their faith and strengthen them in the Christian way of life that Francis Xavier came to the Southern coast from Goa. The Portuguese preached that Christian saints rose up from the common people and these saints were the representatives of people in the real sense of the term. Hence they impressed upon the devotion to Francis Xavier who was a great missionary in Tamilnadu so that the Christians could benefit a good deal from the saint. As canonization of St. Francis Xavier was in progress at the Sacred Congregation of Rites, in Rome, the Jesuits collected information through the official inquiries held at Mylapore, Devanampattinam, Nagapattinam, Punnaikayal and Tuticorin besides other places such as Goa, Cochin, Quilon in India. The official canonization in the year 1622 by Gregory XV ( 1621-1623) helped the Jesuits very much to encourage the cult of Xavier since many were converted by him in Tamil Coast. According to the Portuguese records, there was a church erected at Kottar (near Nagercoil) and it was dedicated to Holy Trinity, in a garden given by the ruler in the year 1603. The Christians of the neighborhood of Kottar especially , from Manakkudi, Pallam and Rachimadam helped in the construction Of the church. Fr. Andrew Buccerio placed in this church a picture Of St. Francis Xavier, since these Christians had great devotion to him. In due course of time we find the Christians often speaking of favors received from God through the intercession of Francis Xavier. Thus Kottar became a great pilgrimage centre. It is reported that Hindus also went there to pray. The Church at Kottar by the year 1644 was built of stone. It is mentioned that the parish also had the substations of Martandanallur, Alur and Kalkulam. There were 658 catholics in the parish of Kottar in 1716.15 The church in Kottar was enlarged in 1865. An altar was made of wood and gold in 1876 through the funds sponsored by Joachim Fernandez. Devotion to Francis Xavier was encouraged by Jesuits in Kandalur especially by Fr. Balthazar da Costa. It was stated that he had requested the married couples who were without any issue for long to get child through praying to Francis Xavier. These couples returned to the Church carrying a child later. In 1541, Francis Xavier (Francisco do Yesu y Javier), started his journey from Lisbon in Portugal to India and landed in Goa a year later. After few months of missionary work in Goa, he left for the southern coast. Soon after arriving in Manappadu in Thuthukudi diocese, Francis Xavier started the missionary work by instructing and strengthening them in the faith. In 1544 Francis Xavier was found often in Travancore to protect and help the Christians of Cape Comorin regions who were driven away from their homes by Vadugars. Under the leadership of Captain Vittal Rao, the Vijayanagar army marched to capture the Venad Kingdom. Pandian and Chola armies joined him. As the news of the Badaga armies marching reached Kottar area, people panicked and had to flee for their lives. Sensing the danger, Francis Xavier, living then in a hut in Kottar, rushed to an elevated area in Vadasery just two kilometers north of Kottar and stood like a colossus holding a cross. Frightened at the sight of a holy man holding a cross, the marauding army retreated heeding to his advice not to march forward. 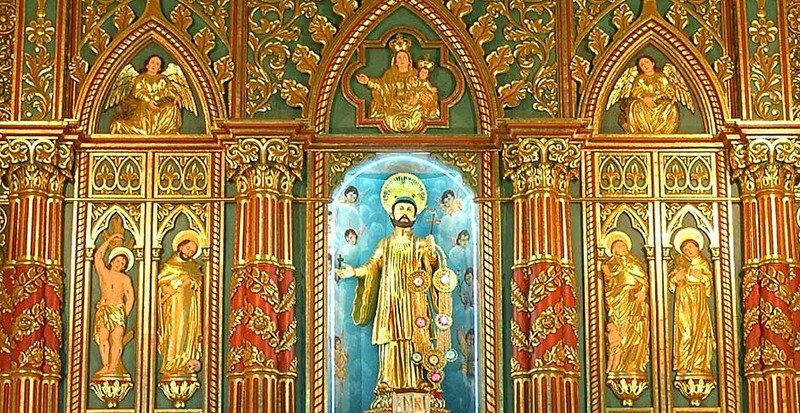 The origin of the Cathedral Church at Kottar begins here: Francis Xavier built a Chapel for Our Lady in the land gifted by the King and used to celebrate Mass there. From Kottar he walked the length and the breadth of the Coastal region instructing and baptizing over 10000 fishermen known as Arasars aka Mukkuvars from Puvar, now in the Archdiocese of Trivandrum in Kerala to Pallam. 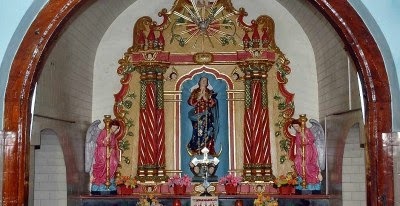 Following death of Francis Xavier in 1552, the Church at Kottar became a place of pilgrimage to the people of the south. According to Fr. Andreas Vaz, in charge of the mission from Cape Comorin-Kanyakumari- to Rajakkamangalam, in 1616 there was a cross in Kottar, a pagan town, which the Chrisitans erected in honor of Fr. Francis Xavier and placed his picture and it was commonly known as the Cross of Father, Master Xavier. In Tamil it was known as Saveriar Kurusady ( Mon. X.II P.591) In 1660, there was a Church dedicated to the Conversion of St.Paul at Kottar and Fr. Andreas Buseria S.J., was the Parish Priest in charge (Mon. Xav. 1 P.589). Fr. Buseria seems to have placed a picture either in the Church or at the Kurusady-Cappella- near the Church. Indeed, next to Goa, Kottar has been and is the most sacred shrine to Francis Xavier. Fr. Andreas Buserio S.J. used to celebrate the feast every year on the day of the death of Xavier and many Christians from the coast gathered there for the feast. ( M.X.II P. 591). Hence pilgrimage to Kottar Church is of no recent origin. It has an unbroken history of over 400 years. What attracted the people were the innumerable, well attested miracles that had taken place in Kottar. Many of these miracles are referred to in the bull of Canonization issued in 1623 by Pope Urban VIII. Popular among the miracles was the raising to life of a month old baby that had died and was carried to the cemetery for burial. The parents full of faith promised to name the child Francis, if it were to revive. To their great joy the child came back to life and the fame of this miracle spread all over the country. (Op.cit.P. 716, 630 etc.) Another miracle attributed to the saint and accepted for his canonization concerns an inland fisherman, Perumal Panical, a poet and a teacher who lived near Kottar Church. He knew the catechism well and ten years before the building of the church composed a poem in honor of the Holy Faith and Fr. Nicholas Spinola, superior of the Jesuit College in Kollam. Fr. Buserio tried in vain to convert him, thinking that he would make an ideal custodian and Kanakkapillai( headman) of the Church. In course of time Perumal contracted the dreadful disease of leprosy and it debilitated him. Despite various treatments his condtion was deteriorating day by day. 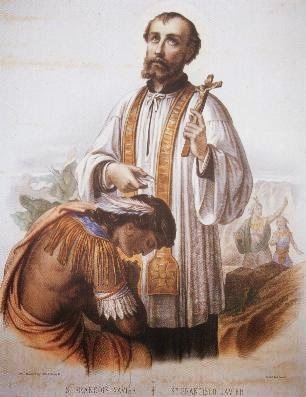 In desperation he prostrated in front of the picture of Francis Xavier praising him in poems and applying the oil, from the lamps burning in front of the Shrine, all over his body. He began to recover soon and completely cured of leprosy. Christened as Francis, he was later appointed Kanakkapillai( headman) of the church( Mon.II P. 590,61) The Church of Francis Xavier in Kottar has been enjoying a great fame as a place of miracles from early times and so no wonder, it attracts pilgrims far and near all down the years. Long before Francis Xavier's canonization it was known as Xavier's Church- Saveriar Kovil in Tamil- and after his canonization, the Church should have been rebuilt and dedicated to him. In the beginning of the 17th century, the offerings in money and oil brought to this Church were so great that it was enough to maintain five other churches in the interior areas. But in the course of many wars that devastated these parts of the country, all five churches were destroyed. But the Church at Kottar survived the attacks due to the fact that it was not only the Christians but also the Hindus who protected this place of pilgrimage. The present vaulted Shrine of Our Lady, said to be on the very spot where the chapel of Our Lady was built, was erected in 1865 when the Church of Kottar was enlarged and vaulted over. It is very small with just enough space to accommodate an altar on which enthroned an ancient statue of B.V.M. in a wooden recedes. The floor of the Shrine is about two feet and a half below the ground level, attesting to the antiquity of the spot and to the care to keep it open as hollowed place by the great saint. In fact at the top of the recedes there is a little angel holding a scroll with an inscription in Tamil, " Come and Worship at the place where his feet have touched, All the pilgrims that visit the Shrine throughout the year and the humongous crowd that attend the feast celebration from November 24 to December 3, make it a point to visit and pray at the Shrine of Our Lady. Bishops and Priests are very particular to celebrate Mass at the Shrine. Many Hindu pilgrims, after their ritual bath, go around the Shrine a stated number of times in performance of their vows. The Church of St. Francis Xavier acquired another glory when in 1752, the mortal remains of the heroic Martyr Devasahayam were interred within its sanctuary. Neelakanda Pillai, an official at the court of King Marthanda Varma of Travancore, was converted to Christian faith by the gentle efforts of the captured Captain of the Dutch Navy, E. B.de Lannoy, then at the service of the King. Neelakanda Pillai was baptized as Devasahayam- Lazarus- by Fr. John Baptist Putari S.J. at Vadakankulam. The king was very furious at hearing the news of his conversion and tried in vain to persuade him to reconvert. But Devasahayam was firm in his faith. Denounced as a traitor, Devasahayam suffered patiently imprisonment and torture for three long years. On the order of the King, he was dragged to Katttadimalai at Aralvaimozhi, at the boundary between the Travancore and Pandya Kingdoms, and shot dead on January 14, 1752. His body was discovered by some Christians who brought it to Kottar to be interred in the sanctuary. The tomb of this heroic Servant of God, whose cause for Sainthood is progressing, is also a place of pilgrimage. From a Kurusady in the sixteenth century, the Church of the Conversion of St. Paul which later became the Church of Francis Xavier, has undergone many renovations and additions. In 1865, the Church of Kottar was enlarged with the addition of Cruciform wings and the present sanctuary and vaulted over. In the same year the Shrine of Our Lady was renovated and vaulted over. In 1930, thanks to the recommendation of the saintly Bishop Aloysius Maria Benziger OCD of Kollam, the Southern part of the Kollam diocese was bifurcated to form the new diocese of Kottar with Msgr. Lawrence Pereira as its first bishop. The Church of St. Francis Xavier and the Rectory became the Cathedral and the residence of the new bishop. It continued as Bishops' Residence until it moved to the present location. In 1942, in commemoration of the fourth centenary of the arrival of St. Francis Xavier in India, a beautiful tower was erected to the Saint in the Cathedral premises, as well as the Grotto to our Blessed Mother and a small Shrine to St. Ignatius, who had sent him to India. The pretty statue that adorns the main altar is said to have been brought from Goa. There is also a major relic of the Saint which is exposed to the veneration of the pilgrims during the feast days. The Cathedral has acquired many styles of architectures. The old church and the vaulting were Romanesque, the extensions and the exterior are Gothic, while the fine stone Mandapam ( Lobby or Vestibule) in front is purely Indian. The entire church presents an imposing and pleasing appearance and a look of greatness. In 1603, a small church was built with mud and wood. In 1640, the church was reconstructed with stones (Report of the Society of Jesus, 1644). In 1640, the church constructed with mud and wood, was reconstructed into a new church with stones and in 1643 the sacred relics of St. Ignatius Loyola and St. Francis Xavier were safeguarded there. 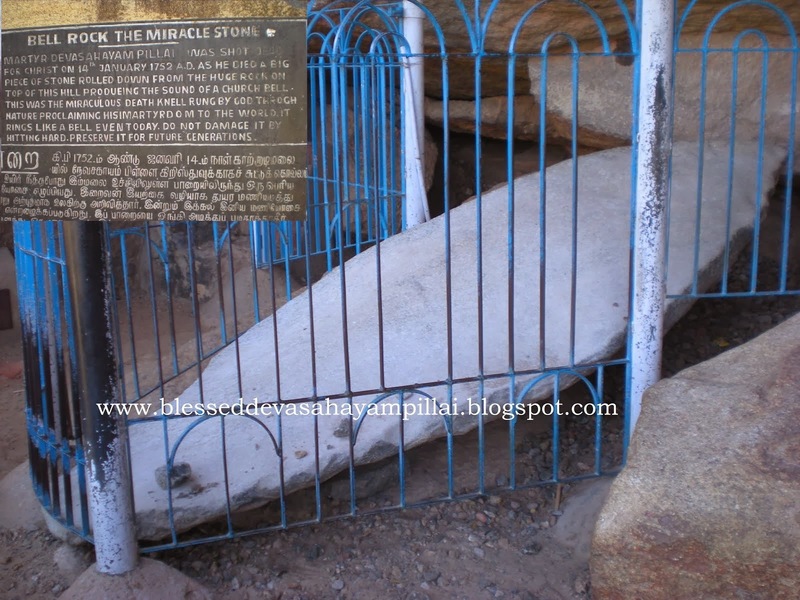 In 1752, the mortal remains of Devasagayam Pillai was buried at St. Xavier’s Church. 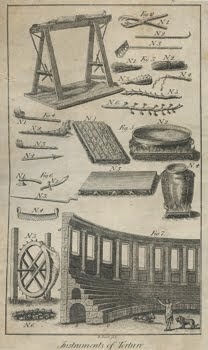 According to the report (1698) sent by Fr. Gomes Andreas, head of the Society of Jesus, Cochin to Fr. Gonzales, head of the S.J. at Rome, a big church at Kottar was built near the small church with stones. According to the report of the Society of Jesus (1733), “Kottar was a big town. It was the headquarters of all Christian Churches of that area. A big church was there and it was dedicated to St. Francis Xavier, the first foreign missionary to visit Kottar. In 1865, the new church was extended on the western, northern and southern sides. So the church looked like a cross. Tiles on the roof were removed and a high dome was constructed above the main altar. A dome was also constructed at the small church (St. Mary’s). Mt. Rev. T.R. Agnisamy, the second bishop of Kottar Diocese was buried in St. Mary’s church on 7th May 1974. In 1876, an architect from Kollam, Jokin Fernandes designed the main altar in wood. The wooden statue of St. Francis Xavier kept in the altar was brought from Goa. During the end of the 19th century a mandap was constructed in front of the church with big stone pillars. The stone pillar mandap represents Indian culture. This mandap was designed and constructed by the architect John Louis Fernandes. Later on when he died he was buried in the mandap itself. In memory of the 400th year of St. Xavier’s arrival in India, a tower and the statue of St. Xavier on the top of it and a grotto of St.Lourdes nearby were constructed at the northeastern side of the church campus. That was donated by J.A.D. Victoria of Manapad of Tuticorin Diocese. Kottar Diocese was formed on May 30th 1930. St. Xavier’s Church, at Kottar was declared cathedral. Mt. Rev. Lawrence Pereira, the first Bishop of the Kottar Diocese was buried in the church on 05.01.1938. Mt. Rev. Leon Dharmaraj, the fourth bishop of Kottar Diocese was also buried in the main altar of the church. When Fr. Barnabas was the priest of St. Xavier’s Cathedral in 1956, the western, southern and northern sides of the church were extended further. The St. Mary’s Church was annexed and became a part of the main church. In memory of the silver jubilee celebration of Kottar Diocese a tall tower was erected on the northern side of the church and blessed by Mt. Rev. T.R. Agnisamy, Bishop of the Diocese on November 24th, 1956. When Fr. Berchmans was the parish priest of the cathedral, the church compound wall was extended further on the northwestern side and a new exit gate was opened for the convenience of the people during the festival seasons. Fr. Berchmans in 2009 constructed a new flag post covered with bronze in typical Travancore style. This type of flag post is unique in churches of Tamilnadu. After seeing the beauty of the flag post, many churches in Kottar, Palayamkottai and Tuticorin Dioceses started to convert their flag posts in the model of St. Xavier’s Church at Kottar. In 2009 a new tall statue of St. Xavier was erected at the entrance of the church. In 2010, Fr. Berchmans brought artisans from Goa to renovate the main altar of the church. 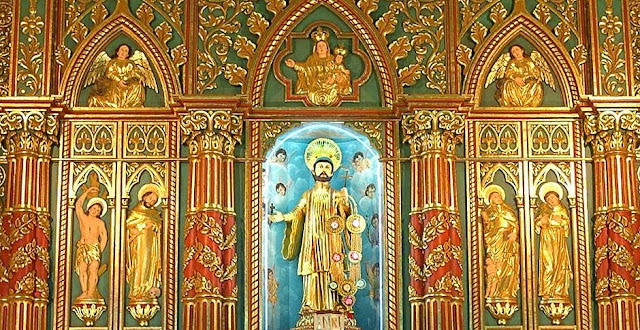 At present the wooden portions of the main altar, the statue of St. Xavier and wooden portion of St. Mary’s Church were covered with gold. Now the main altar and the St. Xavier’s Statue glitter brightly. Nowhere in Tamilnadu can we see such a beautifully glittering altar and the statue of St. Xavier. In 2011, parish priest Fr. Robert Julius and the co-priest Fr. Amuthavalan are taking tremendous efforts to change the colour of the outer walls of the spacious church into milky white. To give this new color to the church and for other renovation works, the church needs nearly Rs.3 million. The parish priest is collecting the money from people as donations. People, who have great faith in St. Xavier, are contributing for this work. The Mt. Rev. 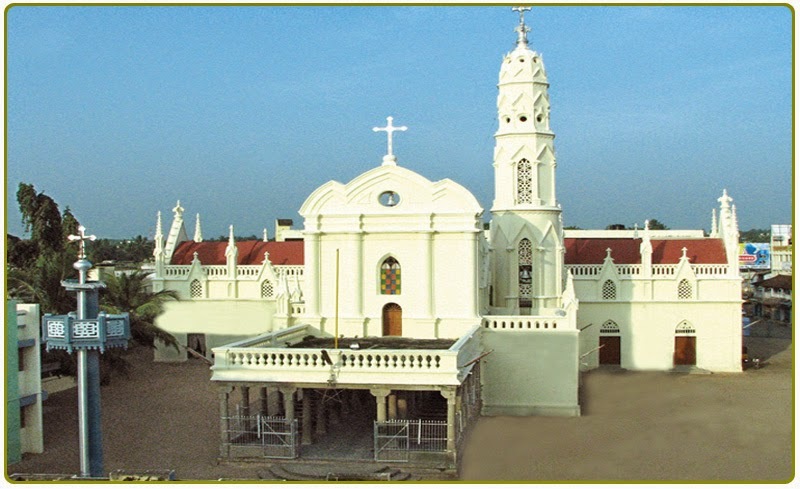 Peter Remigius, the fifth and the present Bishop of the Kottar Diocese and the parish priest of the Cathedral are taking steps to upgrade the St. Xavier’s Cathedral to the status of Basilica.The glory, fame, reputation and miracles of this ancient St. Francis Xavier’s Church at Kottar shall grow in the centuries to come. The annual feast of St. Francis Xavier is being celebrated every year from November 24- December 3, with great piety and fanfare. Each year the number of pilgrims increases by leaps and pounds and the District Administration declares a public holiday for the district of Kanyakumari, on December 3. It is one of the few Christian Churches in India that enjoys a public holiday declared by the secular government. All the nine days of the feast are being celebrated by various groups of people of all creeds which include government employees, teachers, local merchants and transport corporation workers etc. The evening novena mass is followed by public meeting presided over by Government Officials who distribute helps to the needy and the programs conclude with Music and Dance. One of the highlight of the ten-day celebration is the grand Car procession with the statues of the Blessed Virgin Mary and St. Francis Xavier. The honor is always given to the Blessed Mother, decked with rich jewels and ornaments, offered in thanksgiving by the devotees. Men and women, including Hindus, prostrate in front of the Cars in observance of their vows and penance. The Car procession, a remnant of the Hindu custom, attracts thousands of people all the final three days of the feast. 📓 The Chapel where St. Francis Xavier prayed during his stay in Kottar where Eucharistic Adoration goes on from morning till evening on all week days. 📓 The Main Altar dedicated for St. Francis Xavier decorated with 24ct Gold. 📓 The Holy Tomb of Blessed Devasahayam Pillai. 📓 The Relics of St. Francis Xavier, St. Ignatius Loyola and Blessed Devasahayam Pillai are also preserved in the cathedral. At the spot on the hillock (called Kaattadimalai), devotees believe that rocks fell down the moment when he was shot. One rock at the place makes bell-like sound when knocked with a stone. Arun Oswin Kostka. Simple theme. Powered by Blogger.